Fifty years ago, work in developed countries was often defined by relative certainties. Aside from the periodic recession, many nations were at or near full employment. Rapid productivity growth was underpinning an improvement in living standards. A university degree was a meal ticket to a high-paying, secure job as a professional. And for workers with a high school diploma, jobs on manufacturing assembly lines offered a pathway to middle-class prosperity and upward mobility. While this was not necessarily the reality everywhere, it was the model that set expectations for what a career was supposed to look like. Now we live in a much less certain world. In many countries, recovery from the latest recession has been gradual and protracted, with unemployment and underemployment coming down only slowly. Global productivity growth has decelerated sharply, as has pay growth. Cutbacks of private sector benefits and government safety nets are forcing workers to bear more risk than they did in the past. And while their economic impact has thus far been muted, automation and artificial intelligence raise the specter of mass displacement of workers. So what are workers to do? We often hear that workers will have to plan ahead, engage in continuous retraining to upskill themselves, and expect to radically pivot multiple times throughout their careers. But that’s a lot of pressure to lay on a person. It’s hard to know what types of skills are most important to learn, or how to best position yourself to succeed in the face of changing economic times. Today the World Economic Forum releases its Global Human Capital Report 2017, which evaluates countries on how well they’ve optimized their workforces by equipping them with knowledge and skills needed to create value — and be successful — in the global economic system. At LinkedIn, our vision is to create economic opportunity for every member of the global workforce. That’s why we’ve partnered with the World Economic Forum to contribute to the creation of the Global Human Capital Report 2017. One of unique advantages of LinkedIn data is our ability to analyze the labor market in an unprecedentedly granular way. We can break down human capital into its most fundamental and critical component unit: skills. At LinkedIn, we track the supply and demand of 50,000 distinct skills as provided by our members. This allows us to identify geographically where particular skills are in shortage or in surplus. It allows us to identify which skills are emerging, or growing rapidly, or persistent over time, or shrinking in popularity. We can identify the “skills genome” — the unique skills profile — of a city, a job function, or an industry. These types of insights make it possible to advise on which skills are needed when the economy next changes gears. 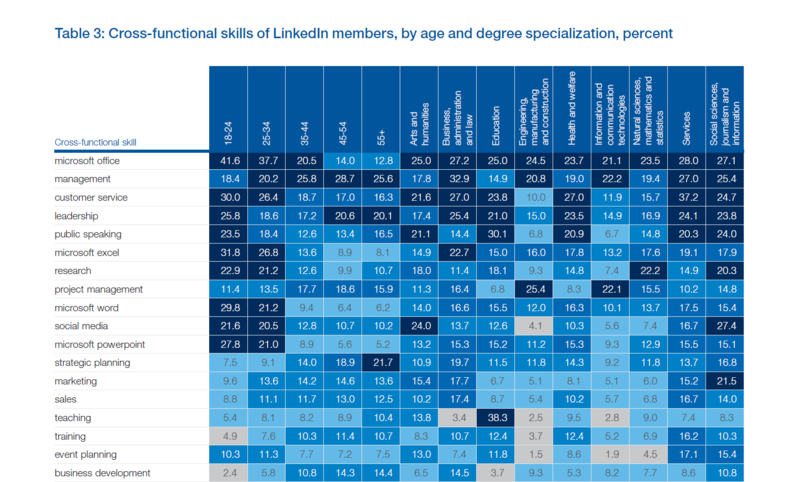 LinkedIn’s research in this year’s Global Human Capital Report explores the skills genomes of different university degrees over time. There are certain skills commonly held by all types of college majors; there are other specialty skills that are more unique to specific fields. So which skills should you learn? We found that, across diverse fields of study, there are certain core cross-functional skills that underpin human capital. These include interpersonal skills, like leadership and customer service, and basic technology skills, like knowing how to use word processing software and manipulate spreadsheets. Having a strong base in these cross-functional skills is important across industries and job titles. Cross-functional skills also give people the capacity to pivot careers when needed. Retraining becomes a lot easier when you need to learn just one or two new things, rather than an entire new field of knowledge. While cross-functional skills are versatile and likely to stand the test of time, they aren’t necessarily the ones that will launch you into a lucrative career off the bat. Indeed, our data shows that younger generations tend to study more specialized fields than their predecessors, and today’s travel and tourism or international studies majors have more niche fields than, say, the history major of yore. This broader economic trend toward specialization reflects a widening economy that demands more specific skills from the workforce as it grows. What is clear is that interpersonal skills are unlikely to be rendered obsolete by technological innovation or economic disruptions. In a changing workforce, it's having a strong foundation in versatile, cross-functional skills that allows people to successfully pivot. Learning the latest or hottest technology skills shouldn’t come at the expense of investing in the basic, core skills that people need to be successful in the workforce. Helping governments and other public policy stakeholders to better understand, analyze and approach the development of their human capital in this way is our ultimate hope. We’re excited to be partnering with the World Economic Forum, and to leverage our unique LinkedIn dataset as part of the Global Human Capital Report 2017, to help accomplish this goal. We look forward to our continued work together. For more research into the skills held by today’s global workforce, check out the full Global Human Capital Report 2017 here.